An article in EContent Magazine describes of a “proverbial fire hose” that endlessly supplies “junk” data that must be sifted through to discover right, targeted information and relevant intelligence. A report from Basex Research Group is cited, indicating “information overload” is responsible for draining 28% of worker’s time, resulting in an annual productivity loss of “nearly $997 billion”. We need the capacity to digest and retrieve all this information and we cannot do it alone. It would be useful if the intelligence infrastructure were designed as a game that included “enterprise-ready content curation tools” and machine algorithms that would ensure players effectively “share, collaborate and act upon” gathered intelligence in real-time. Even if you feel like you’re on top of all your content, chances are that you’ve missed some vital information nuggets. 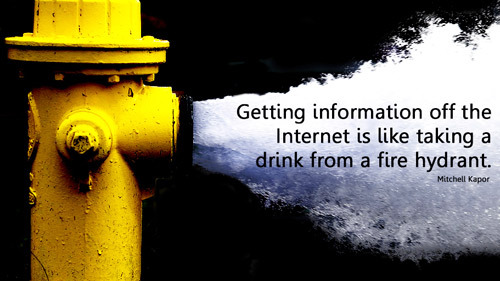 Drinking in all the data from the proverbial fire hose is simply no longer an effective way to consume content. A recent report from Basex Research Group quantifies this wasted time by estimating that workers lose 28% of their time to information overload. That amounts to nearly $997 billion in annual lost productivity for companies. CIOs and CTOs are increasingly investigating new process and technology solutions that can mitigate the rising cost and productivity losses associated with data deluge. It’s not just about the volume of information. It’s about finding the right, targeted information in a sea of “junk” data. Businesses have just started to realize the importance and benefits of aggregating relevant intelligence. The next step will be to then offer collaboration capabilities on top of content, which enable users to effectively share, collaborate and act upon the discovered intelligence in real-time. Content curation, through both machine algorithms and human intervention, will become a major integrated part of the enterprise productivity and intelligence infrastructure.